With three JR railroad stations at Kichijoji, Mitaka and Musashisakai, a connection with the Keio Inokashira Line at Kichijoji station, the termination of the JR Sobu Line and Tokyo Metro Tozai Line at Mitaka Station, and the connection with the Seibu Tamagawa Line at Musashisakai station, the railroad system in Musashino City is well developed and rich in traffic convenience. 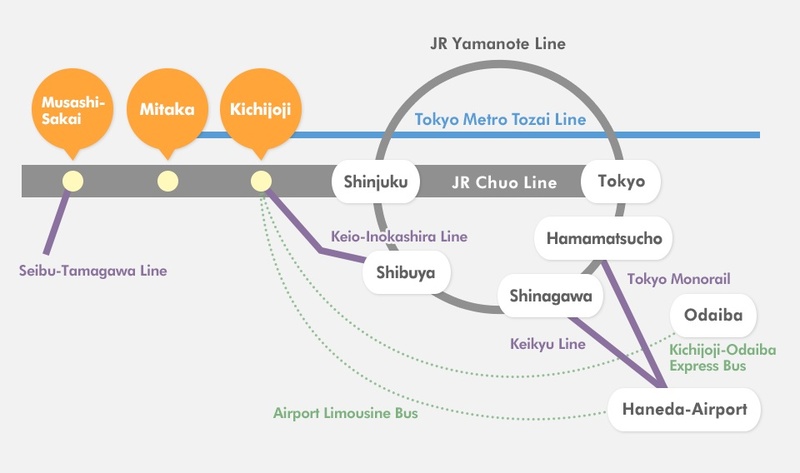 There are also many bus routes in the city run by companies such as MU-Bus, Kanto Bus, Odakyu Bus, Keio Dentetsu Bus, and Seibu Bus. Bus routes cover almost all of Musashino City. This section introduces convenient transport services for sightseeing. Kichijoji Shopping Parking Lot "Mu Park"
Park and Bus Ride Lot (a little bit outside of Kichijoji) (*) You can park your car here and head off to Kichijoji by MU bus. * Use this system to park your car and then move on to your destination by public transport. Information for bicycle / car parking lots (motorbikes can also be parked) and rent-a-cycle in Musashino city is here.